Roisin Raises Funds for Special Needs. A very popular programme on RTE TV has been Operation Transformation and it has inspired many to lose weight and to increase their general fitness levels. In 2016 the makers of the programme made a big effort to get people involved and thus help people to get more healthy by participating. They urged pharmacies around the country to encourage customers to sign up and take on the challenge. The new pharmacist in McSorley's Pharmacy, Emyvale, Kevin Maguire, was keen to get people enrolled and he encouraged the staff in the pharmacy to participate as well, which would show good example and get others to enrol. He suggested that it would make it easier if one picked a charity and and asked members of the family and friends to sponsor the weight loss. This idea struck a chord with Roisin Austin and she immediately knew the charity she would raise the money for. She wished to support the provision of the new Autism Centre as part of the Errigal Truagh Special Needs Centre at Ballyoisin and so she accepted the challenge. She maintained her programme with which she hoped to lose the weight and when the time came for the final weigh-in she was delighted to have reached the total of 2½ stone lost. 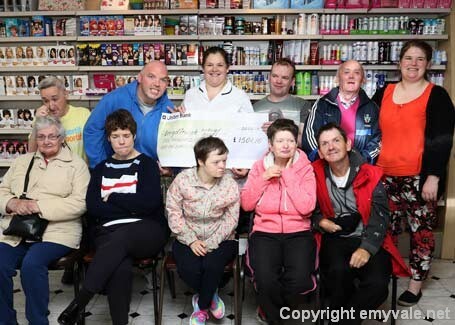 This raised the sizeable sum of €1501.10 and she presented this to the members of Errigal Truagh Special Needs at a function in the Pharmacy on Monday, June 20th. Members of the ETSN group were delighted to attend and enjoyed a feast provided by the pharmacy. They also received a lovely box of goodies to take away with them as well as the cheque. Well done to Roisin on raising this funding which will be extremely useful as the Centre nears completion and the Service Users prepare to move in. Well done too to Kevin, Marie-Therese and the other members of staff for their support to Roisin and thanks to all who sponsored. More Good News: There was further good news in McSorley's Pharmacy when I was there as Megan McCarron has just received her qualification as A Medicine Counter Assistant, which means she is fully accredited by the GPhC as meeting the training required for staff working on the medicines counter. 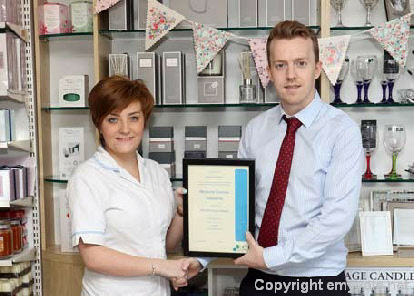 Megan has been employed by McSorley's Pharmacy for 4 years and has already qualified in Vichy Skincare training. Congratulations to Megan on her success and it is nice to see staff involved in training to enhance their abilities and qualifications. Our picture show Kevin presenting the certificate to Megan. Top left: shows Roisin handing over the cheque to members of the Errigal Truagh Special Needs group. Top Right: Roisin and Kevin with members of the group who are holding tight to the cheque. To the right: Roisin with Finbarr and Eileen.